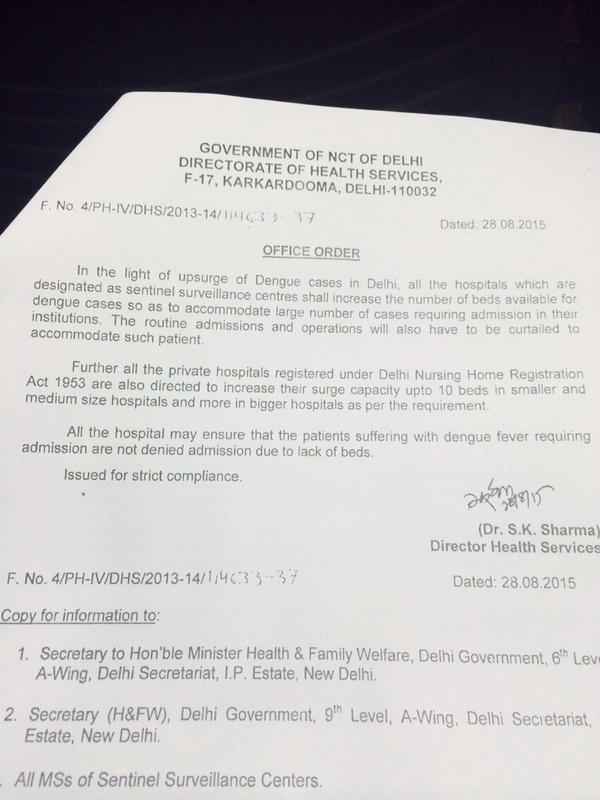 Amidst the directive issued by the Delhi Health Minister, Satyendra Jain has asked to increase the bed capacity in the government hospitals by 1000 new beds to accommodate dengue patients. Further for the private hospitals, the government has asked them to increase hospital bed strength, saying that it will relax the basic requirements regarding bed strength etc (beds distance, bed limit per hospital) till the 15th of November. Government has urged to keep buffer provisioning eg. if a hospital has 50 beds, to make it 60. All private hospitals registered under the Delhi nursing home registration act 1953 are also directed to surge capacity upto 10 beds in smaller and medium sized hospitals and more in bigger hospitals as per the requirement. 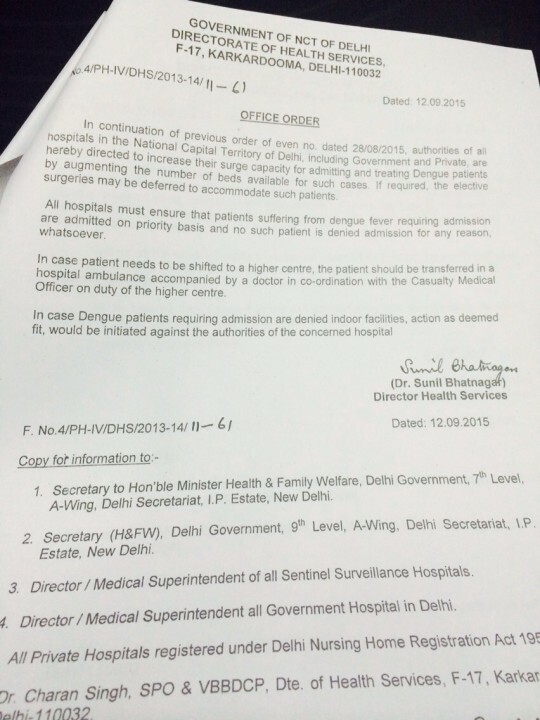 Besides, all the hospitals have been advised to defer the elective surgeries to accommodate dengue patients. If a patient needs to be transferred to a higher centre, the patient should be transferred in a hospital ambulance accompanied by a doctor in coordination with the Casualty Medical Officer on duty at the higher centre. If a hospital doesn’t have ambulances, hospitals have been urged to use a CAT ambulance. 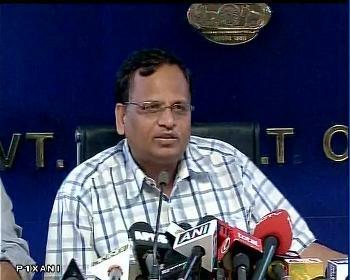 Delhi state government has launched 1031 as the helpline number to assist the dengue patients in the capital. The service will provide callers round-the-clock information on the disease and its treatments, as they canceled leaves of doctors and paramedical staff including nurses and lab technicians in city hospitals. “We have directed municipalities to spread awareness on the adverse affects of self medication and have also directed hospitals to open special fever clinics to deal with patients of suspected Dengue cases, “an official said. The government has directed all hospitals to open special fever clinics to deal with patients of suspected dengue cases to ease the rush in emergency wards. Union health ministry on Monday directed the Delhi government to take action against private hospitals which are overcharging for conducting dengue tests. It was also decided at the meeting that testing kits should be taken only from the government designated laboratories and hospitals. “Adequate stocks of NSI and IgM testing kits to detect dengue cases are available with identified 514 sentinels surveillance hospitals and apex referral laboratories, whose list is updated on the health ministry website,” the health ministry said in a statement. More importantly, government has strictly said there should be no overcharging in private hospitals. If a hospital has increased the rates in the past one month, the Ministry has directed them to bring it back to normal levels.